Yesterday, Polly and I drove home to our base in Leavenworth from Washington Pass. Yesterday we drove to Washington Pass from Leavenworth as well, but I’m getting ahead of myself. On the drive home we brainstormed tag lines for the Live Your Dream grant trip report that we need to write for the American Alpine Club. Polly and I met in Indian Creek almost two years ago. We were both pretty stoked to meet another female who was psyched on rock climbing; since our first encounter we have made sure to align our schedules for at least a few weeks of climbing together every year. Zion, Red Rocks, the Whitney cirque. 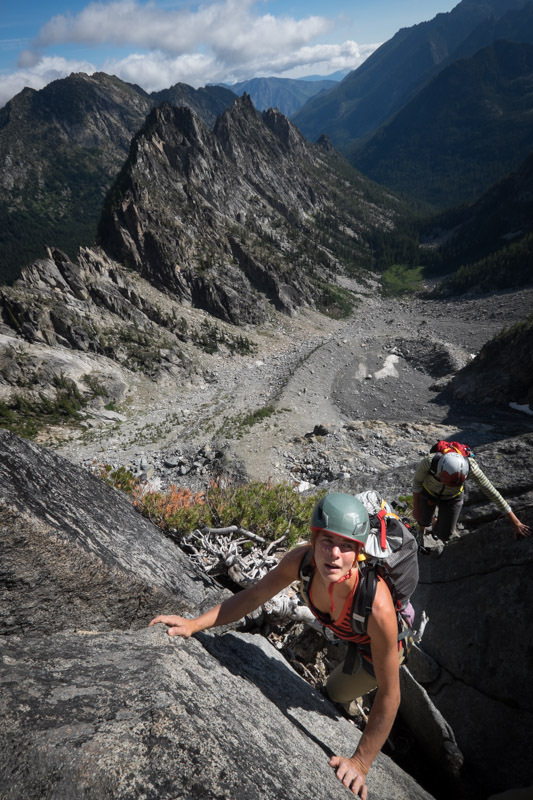 This August, true to form, Polly and I had two weeks of alpine bliss planned in the North Cascades, for which we received a small grant from the American Alpine Club. 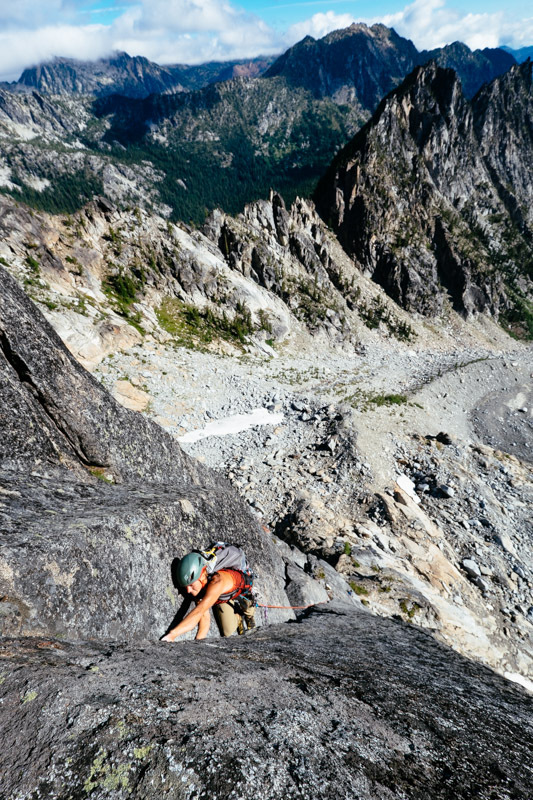 I had an ambitious calendar written out, stacked with missions such as a triple link-up in the Enchantments (18 pitches of climbing and 18 miles of hiking), a late season romp on the Torment-Forbidden traverse, big days at WA Pass. Thwarted by weather for the first four days, we finally got in some climbing, and completed day trips up the Complete North Ridge of Stuart and the Stanley-Bergner on Prusik Peak. We were raging: moving quickly and efficiently, ticking climbs off our list, finally finding splitter weather and great conditions. And we weren’t having fun at all. It just wasn’t working out. I could write pages trying to figure out the various dynamics and complexities that led to our “break-up” in the Blue Lake parking lot at Washington Pass, and I might not be any closer to the answer than when I started. Insecurities, miscommunication, mind-reading, competition, stubbornness, different styles and worldviews. It’s nothing new, and it’s something we all know too well: relationships are complicated. Relationships are complicated, and the more you try to do with them, the more complicated they become. Coffee dates and bike rides are one thing, climbing is another. I don’t know much about marriage, but on a relational spectrum with “random acquaintances” on one end, and “marriage partners” on the other, I’m pretty sure “alpine climbing partners” would be closer to the latter than the former. One of us wanted to push harder than the other, go bigger, go bolder. The other felt weighed down by the burden of having to keep up. One of us felt consistently judged and criticized, the other felt like she was constantly put in the position of having to defend herself. One of us felt lonely, like there was no connection. The other didn’t know what to say. Our reasons for climbing are perhaps different; our styles are most certainly different. We’ve been aware of our incompatibilities and tried to work past these dynamics in the past, but alpine climbing pushed our dynamics further than cragging ever did. This time around working things out felt like too much work; it felt like we should just chalk it up to not being a good fit and move on. And once that decision was made, you know, it was like both of us felt a great wave of relief. The silence between us dissipated and we talked the whole drive back to Leavenworth. We joked about our trip report, and made the mutual decision that we wanted to be honest and real in portraying our trip. We stopped to enjoy the Mazama store, and later to buy fresh peaches and milkshakes. And once back in Leavenworth, we divided up our gear, hugged, wished each other well, and parted ways. It was more of a quintessential break-up than any I’ve experienced before. It feels hard to write about though, like I need to dance around conflict and be careful with my words. Like not getting along with everyone makes me a really, really bad person. I hate the idea of not being in a harmonious relationship, and I know Polly does too. I fear that anyone reading this will automatically place me on their “banned partners” list. I fear that I’m too particular. I fear that I’m hard to get along with. However, despite my fears, I feel the need to share. I think that we in the climbing world could stand to talk more about the importance of partners, and I guess this is my reticent attempt to throw my story and some reflections into the void. In my opinion, climbing partners are the unsung heroes of climbing; they’re the most under-appreciated tool in a climbers tool-belt. We all rave about bomber nut placements, a perfect hand jam right when you need it, a snowy glissade when we thought it’d be a chossy descent. But all of that hardly matters unless we have a compatible partner with whom to share it all. We tie in on a rope with our partners, undertake daunting tasks together, trust them with our lives. We spend more concentrated time with them than we do with our significant others, making countless small and large decisions together. Climbing partners are a pretty big deal. And just like we can’t be best friends with everyone, just like every guy out there can’t be my ideal life partner, a compatible climbing partner is a rare find. A good climbing partner is like gold, and we should all be thankful for the ones we have. We should nurture these relationships just like we would any other. 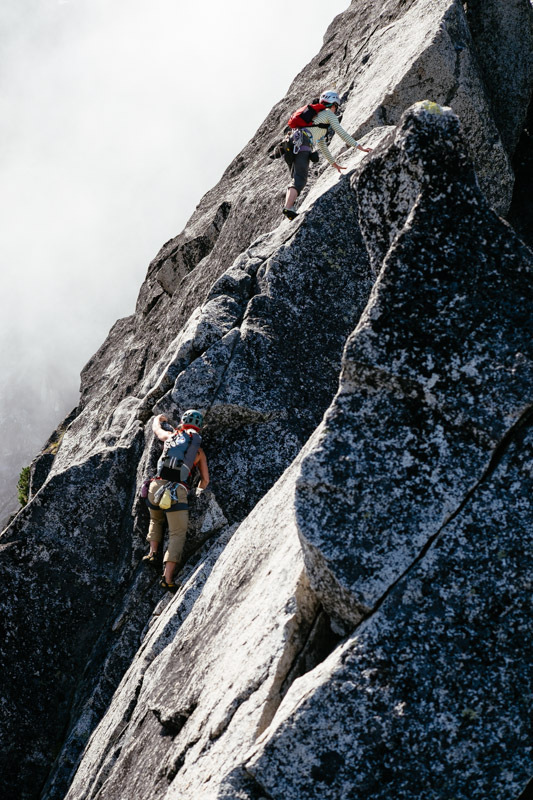 We should be aware of the dynamics in our partnerships, and be cautious in choosing which ones we push to more difficult environments (alpine climbing vs. cragging). We should drive the elephant out of the room and talk about climbing partner dynamics, good and bad. Conflict happens. And when things go awry, like they do in any relationship, it doesn’t mean we’re bad. It’s just another sign that we’re alive. Very nice write up, Jenny. Honest and raw. Life and climbing and relationships are rarely easy – but in this case, I’d argue a bad partner is as valuable as a good one. I hope you and Polly learned a lot from the experience, and come out of it better friends on the other side. I’ve been there before with friends of my own! I love all of your articles, but I think this one is one of the best. People don’t usually talk about this subject. It feels good to see it written! Thank you.